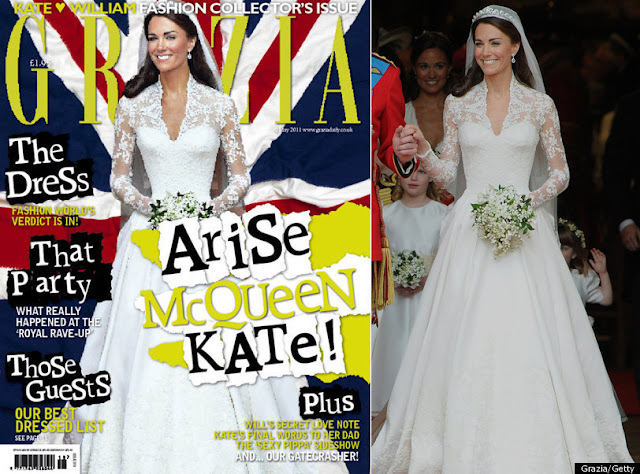 I'm sure you all recall the speculation that followed when Grazia magazine released their May 9 issue, featuring the Duchess of Cambridge in her Alexander McQueen wedding dress. Duchess Kate looked frighteningly thin on the cover. Immediately we all knew the magazine had made alterations to 'slim down' Kate's already very slender figure. After investigating complaints the Press Complaints Commission said 'The magazine explained how the image had been altered to remove the arm of Prince William so that the Duchess could be featured on the magazine cover alone'. Today, the magazine released a statement admitting that they did digitally doctor the image. 'We had wanted a great image of the Duchess on her own, but all the photographs had the Duke in too....so we asked our reproduction house to remove him from the picture. This would have left the Duchess with only one arm, so they copied over her arm to complete the picture'. The statement continues with the magazine apologising for giving the wrong impression to readers. I think whatever the reason, making an iconic figure like Kate appear even slimmer does send out the wrong message. She is already very slender and honestly, there were numerous photos of her on her own. Walking up the aisle, stepping out of the car etc. These magazines often write articles condemning Kate for being too thin yet behind the scenes change photos in this manner on a regular basis. It does send out mixed messages to readers. When I read a magazine I want to see real photos not fakes. These images do not accurately represent the person they are writing about. Digitally slimming celebrities is common practice now. Why do magazines feel their readers want to see this? Does this news change your opinion of Grazia magazine?